Canada has ordered an Eritrean envoy to leave the country following claims he demanded contributions from expatriates to fund Eritrea's military. Semere Ghebremariam Micael, head of the Eritrean Consulate General in Toronto, has been under investigation for the practice. 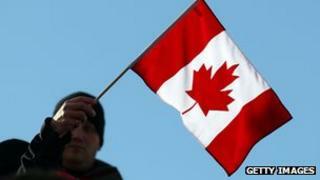 It is in breach of both UN sanctions against Eritrea and Canadian law, the Canadian government said. Mr Micael has been given until on 5 June to leave. "Canada has taken steps to expel (declare persona non grata) Mr Semere Ghebremariam O Micael, consul and head of the Eritrean Consulate General in Toronto, effective immediately," Canadian Foreign Affairs Minister John Baird said in a statement on Wednesday. "Today's actions speak for themselves," he added. The dispute centres on the African nation's efforts to impose a 2% "diaspora tax" and "national defence" fee on Eritreans living abroad. The UN Security Council toughened sanctions against Eritrea in December 2011 over its alleged support for Islamist militant groups such as Somalia's al-Shabab. The sanctions include a block on remittance tax imposed on nationals overseas. Mr Michael has previously been warned against collecting funds from Eritrean expatriates living in Canada. The consul said it would comply with the Canadian government's ruling in September. But recent reports said Mr Michael had again started demanding the payments. "You have to go to the consulate and they arrange how you have to pay the money," one Eritrean in Toronto, who asked not to be named, told Canadian broadcaster CBC. "They want 2%… they don't give you a reason. You have to pay the money," he said. "My family [in Eritrea] would get in trouble if I don't pay." Mr Michael has denied breaking the law, saying he was merely providing "information" to those who want to donate, according to Canada's National Post. Video Iran link to alleged al-Qaeda Canada terrorist plot?